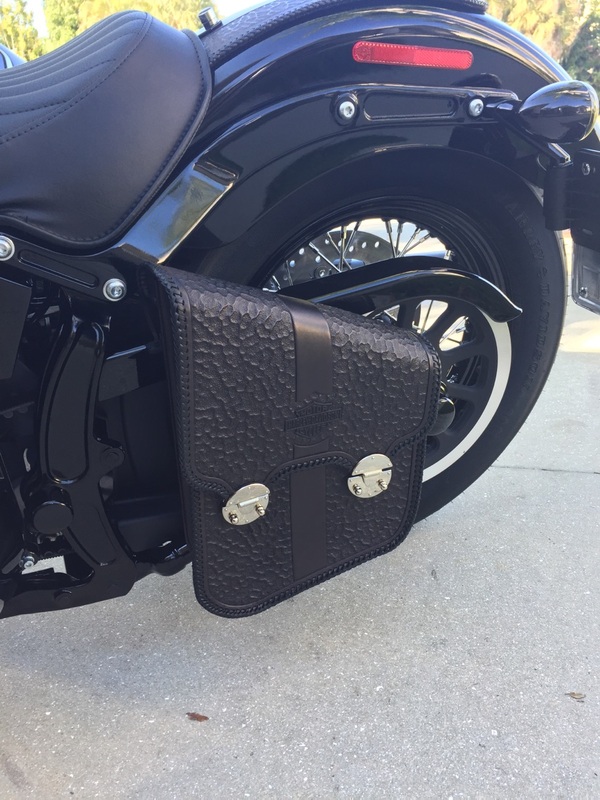 With more and more women buying Harleys every year and taking to the road, I’ve seen an upswing in more feminine designs for the leather accessories. This is great as they can be fun to tool and something you don’t always see at a bike show. Done well, floral designs can really add a fun look to the bike. 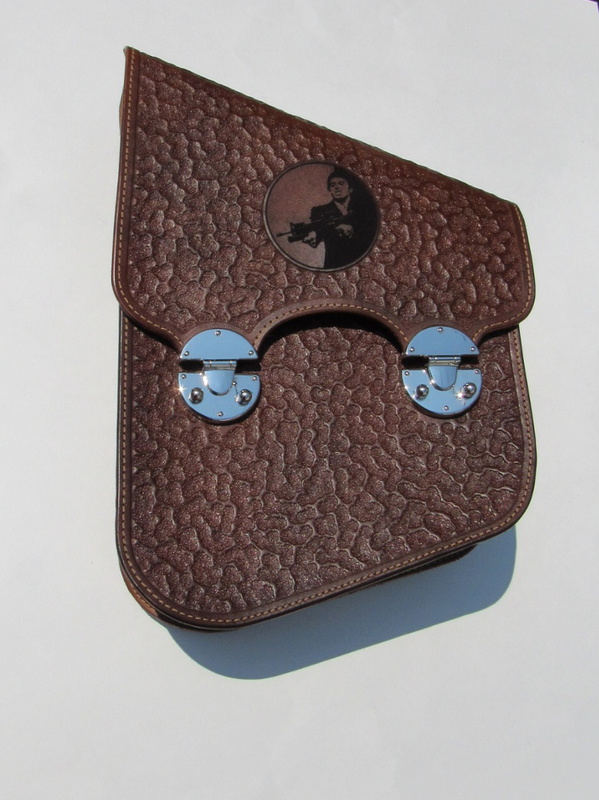 For the guys, similar designs evoke a vintage or Western theme, adding some authenticity to a gunslinger style many like. 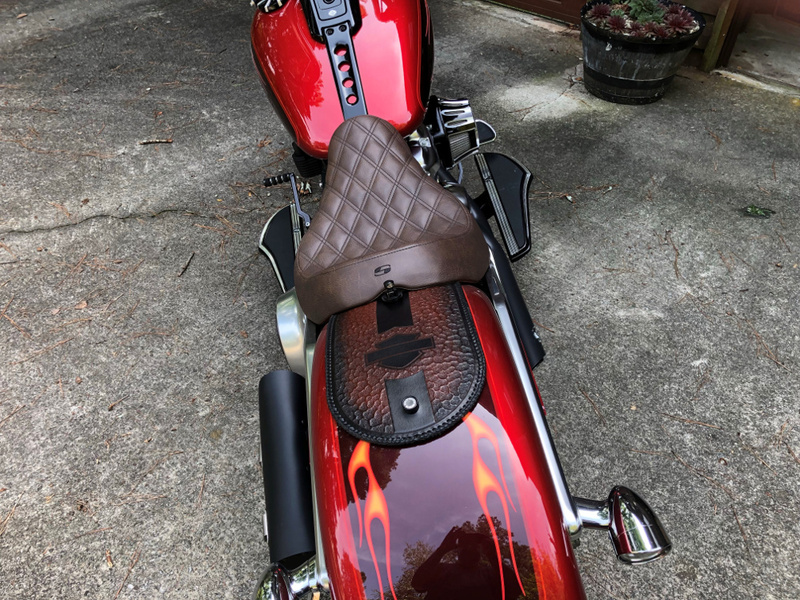 With so many styles of flowers, vinework, and then adding in other bits like guns, butterflies, crosses, or even skulls, you can really make your floral hand tooled leather Harley tank bibs, fender bibs, bags, and other accessories truly one of a kind. 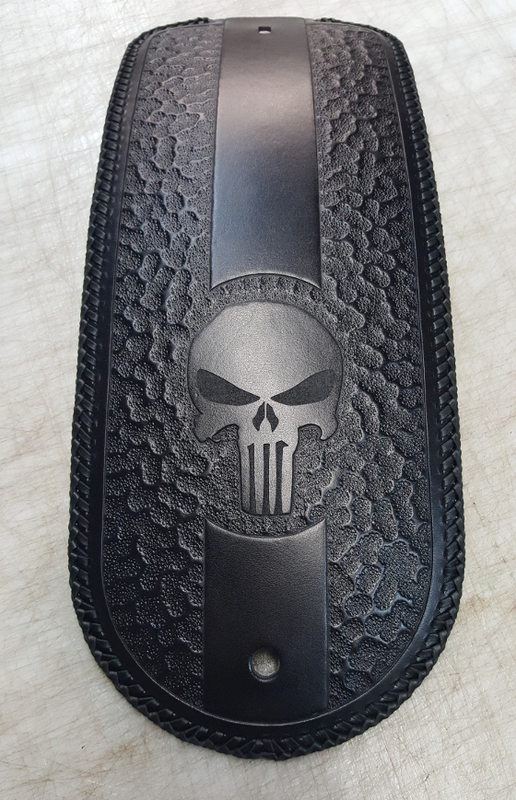 We can alter existing designs or draw up something completely unique for your ride. 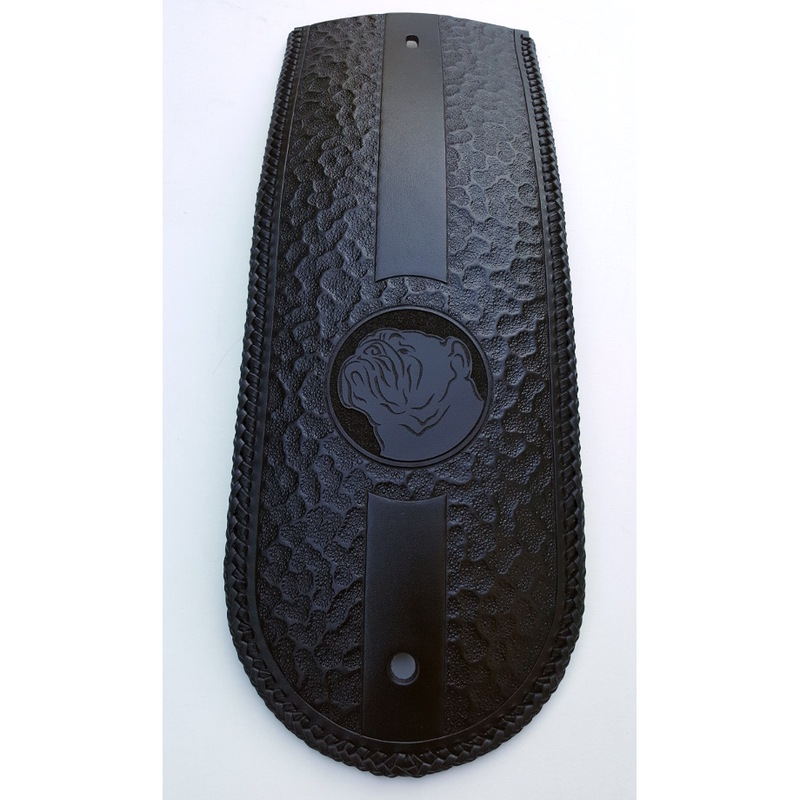 Been a few requests for these leather leg guards (heat shields) for the Harley Softail Heritage, Deluxe, Slim and Fatboy lately. Pretty standard shape, I refined the curves a bit in version 2. 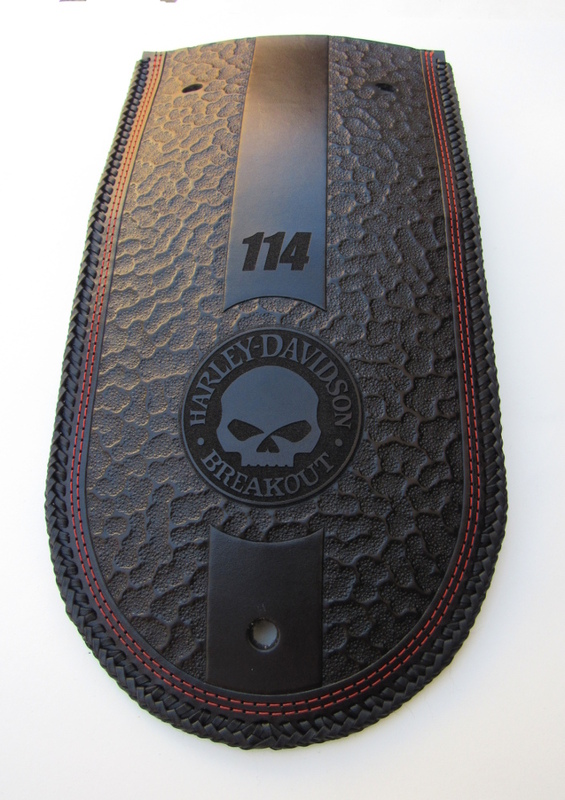 The size and shape shape of these are great as they allow for a large handtooled design to personalize your Harley. 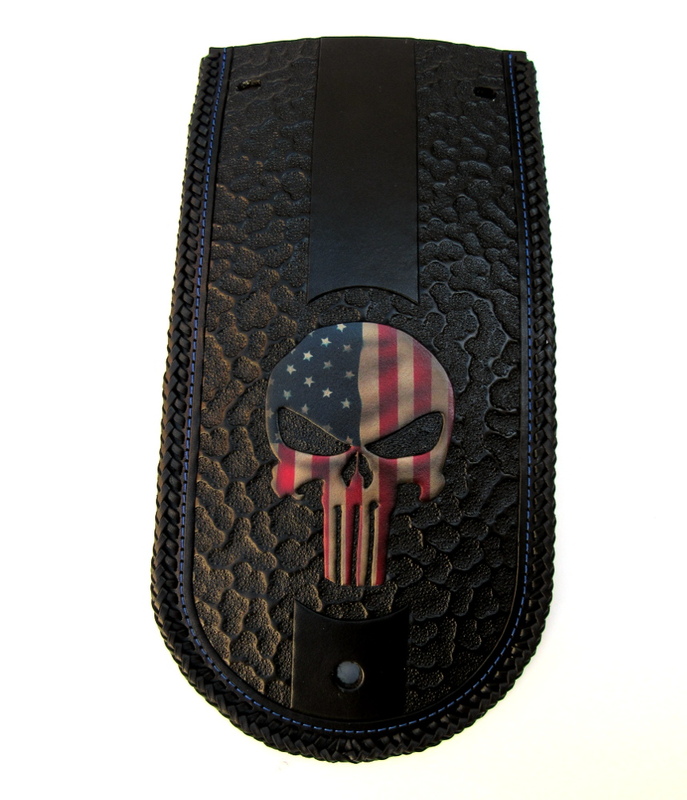 Most recently, a Facebook Softail group post by client Gail had made the floral design shields very popular. I like to change each design slightly, different flowers, altering the petal and vines placement, etc. to make each one a bit unique. 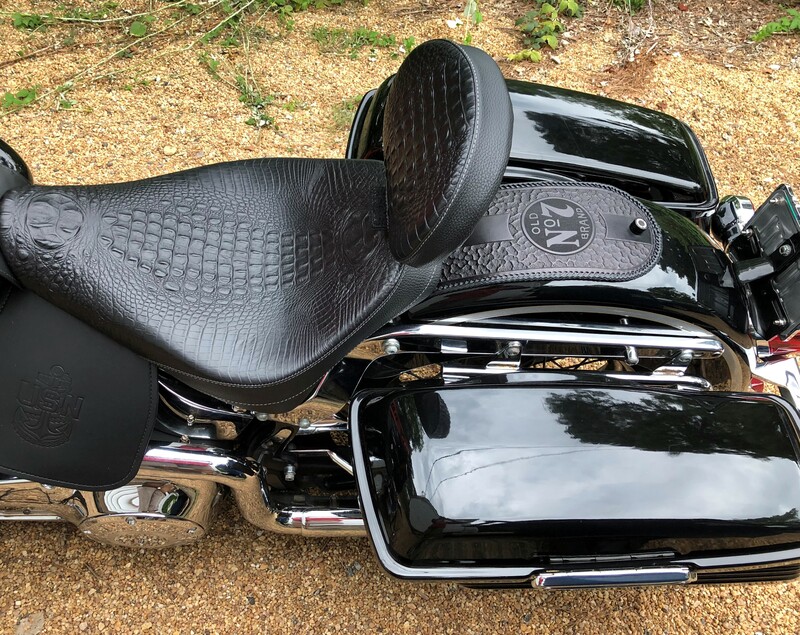 And as always, the client has their input to make it theirs For those aren’t into flowers, I can also make these Harley leg guards to match aftermarket seats like Mustang seats diamond stitch, LePera seats, Corbin seats and Saddlemen seat in matching materials. 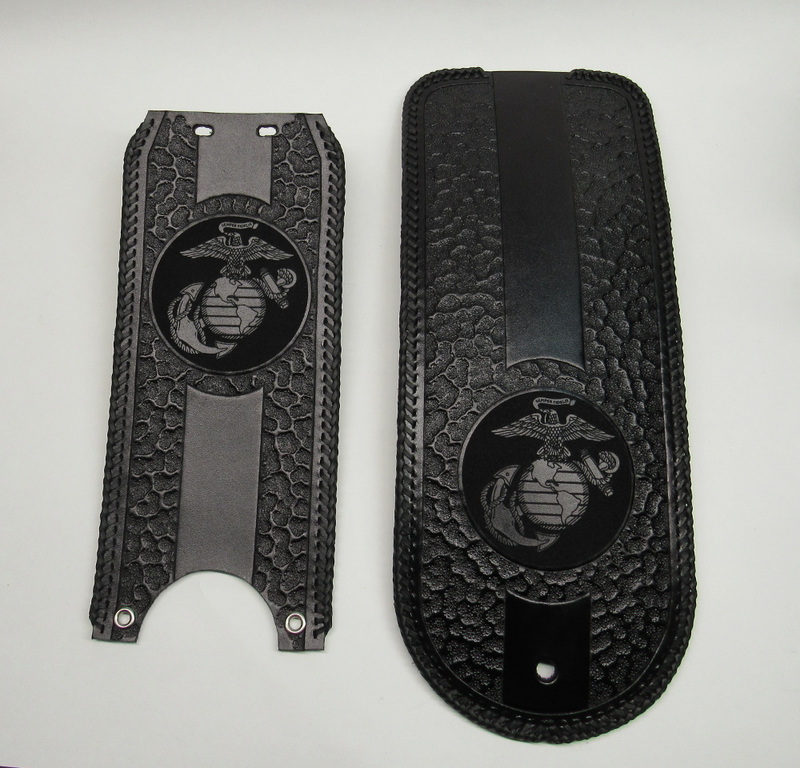 A few examples of the matched pieces are below as well. 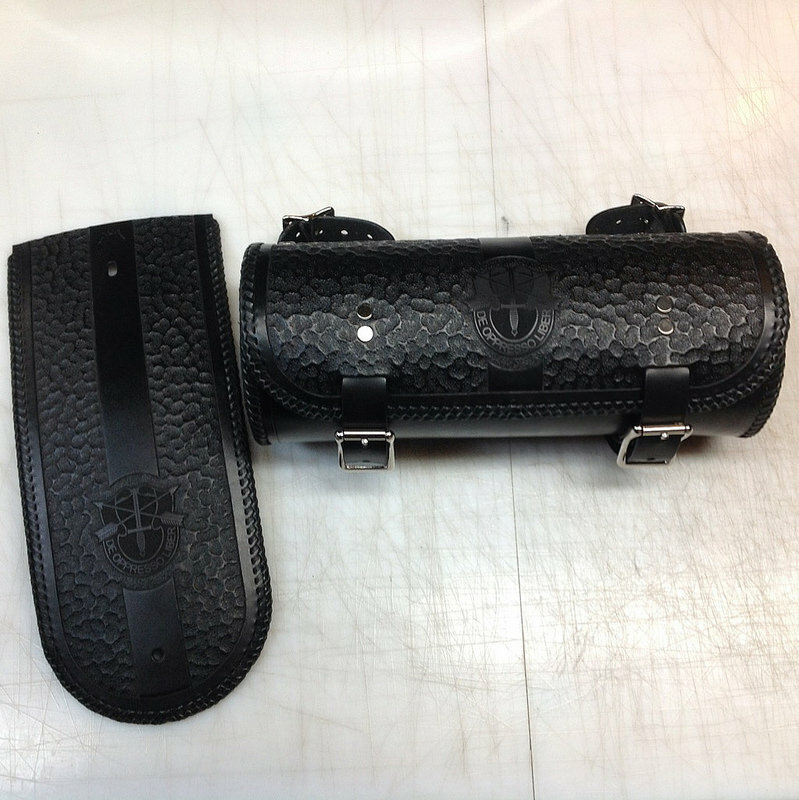 Here is a new style of custom leather motorcycle & bicycle tool bag I designed. 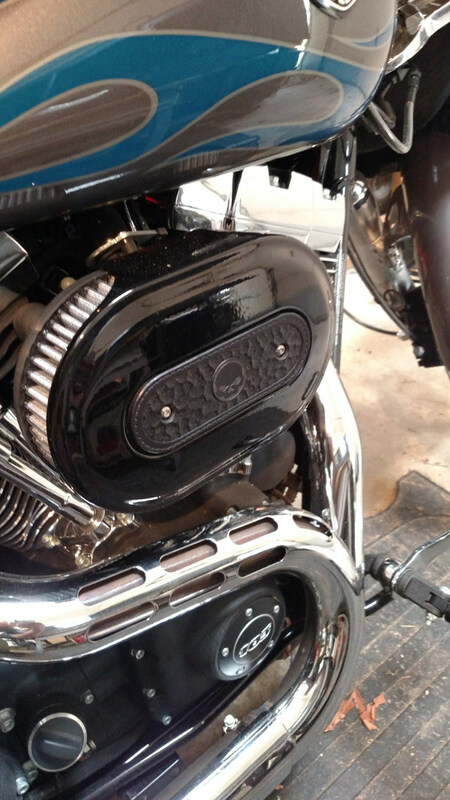 This 4″ round x 12″ long bag is designed to be mounted on the handlebars or under the headlight or behind a spring seat. 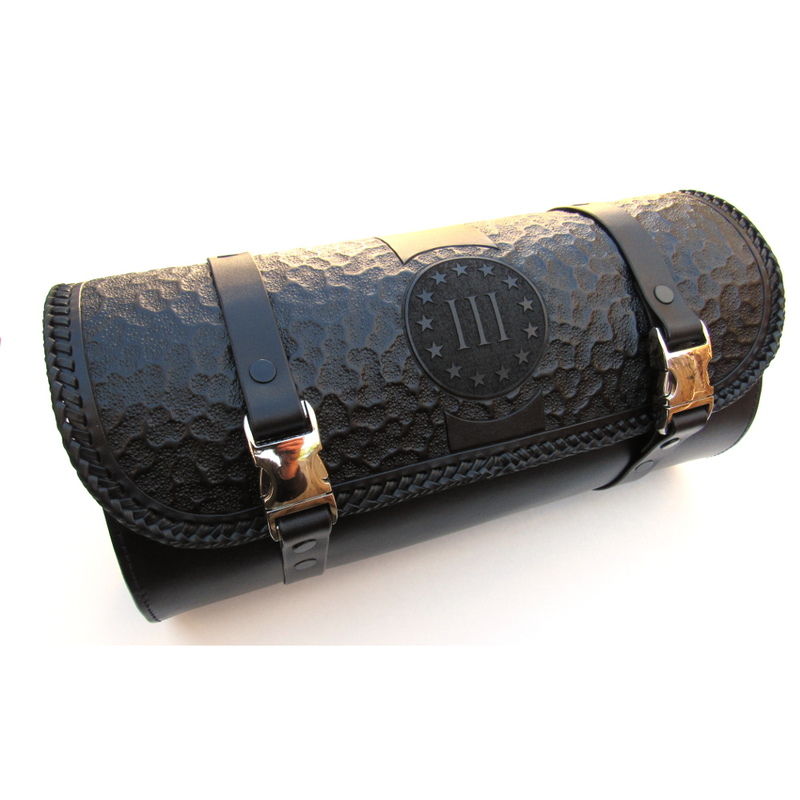 The flip open flap exposes the zippered pocket, making it very weather resistant but easy to access. 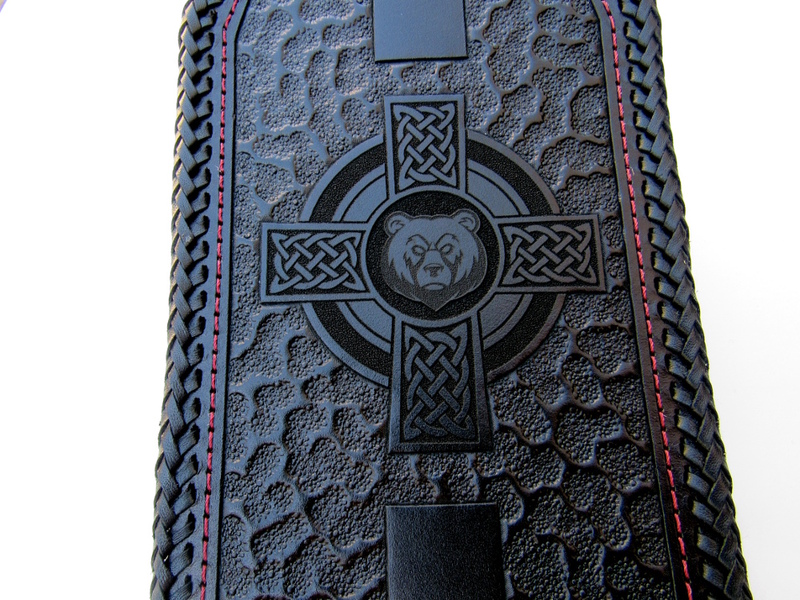 They can be tooled, engraved and airbrushed for a unique style, check out the pics below! 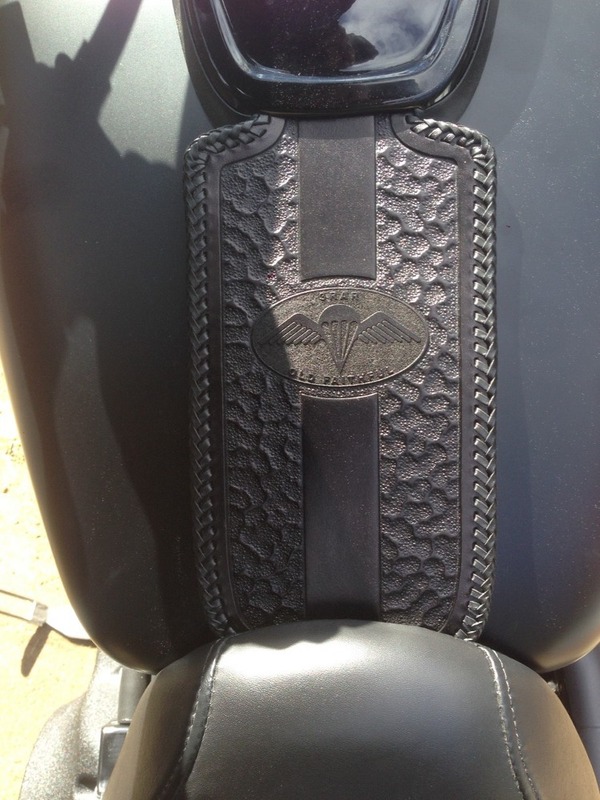 New Custom Harley tank bib style – Floral Corset! 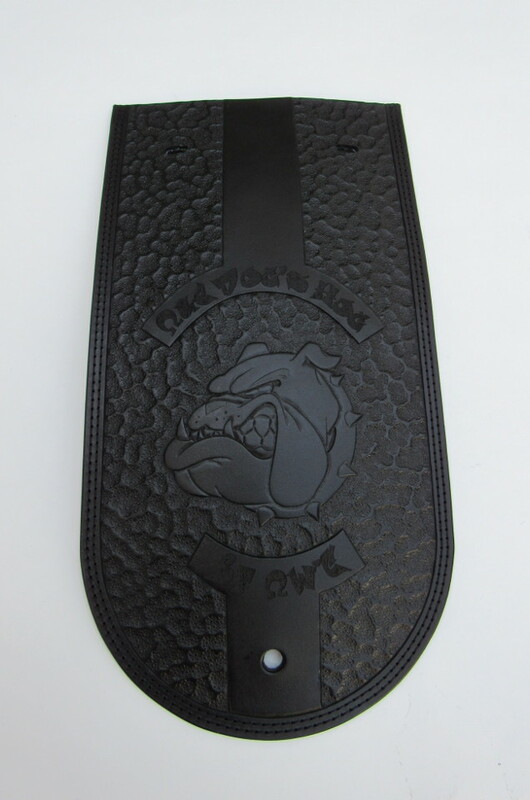 This was a Christmas tank bib request from a client and has proved to be very popular with the lady riders that follow the Three Mutts Customs facebook and Instagram pages. 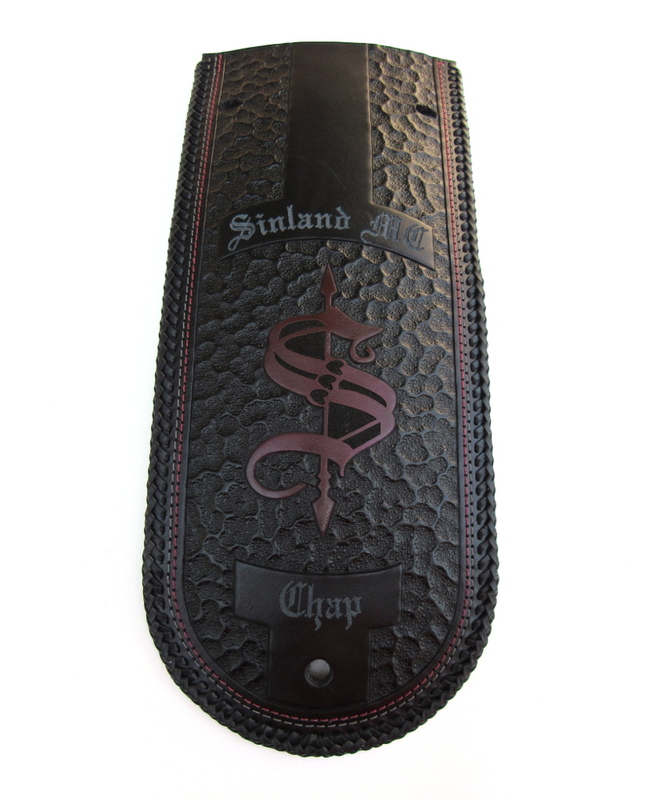 A solid leather core, overlaid with any number of colors, in this case light gray, and then topped with a hand tooled and braided leather corset piece. 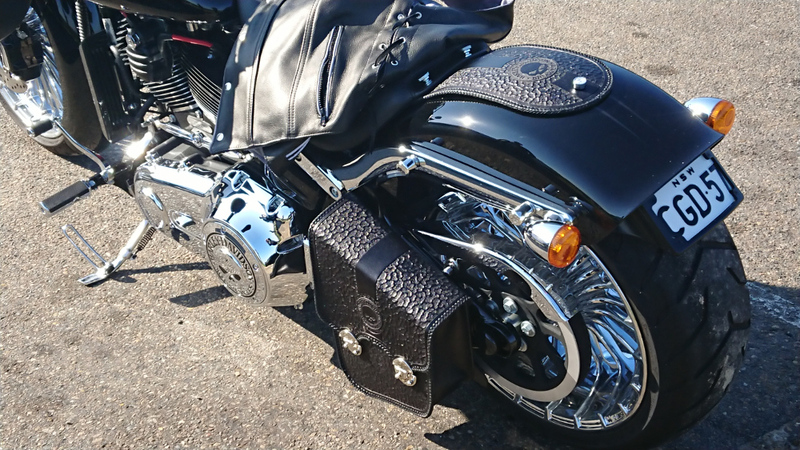 In the photos, the tank bib is shown on a 2018 Harley Softail Deluxe but it can be made for any Harley and a number of imports. The floral pattern was laid out to flow with the bib, other flowers like daisies, traditional Texas roses, etc. can be substituted. 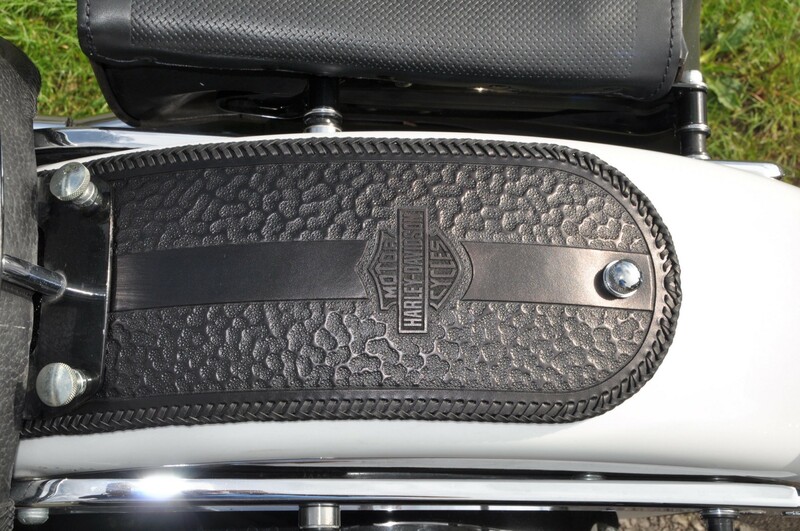 Aftermarket seat matching motorcycle accessories! 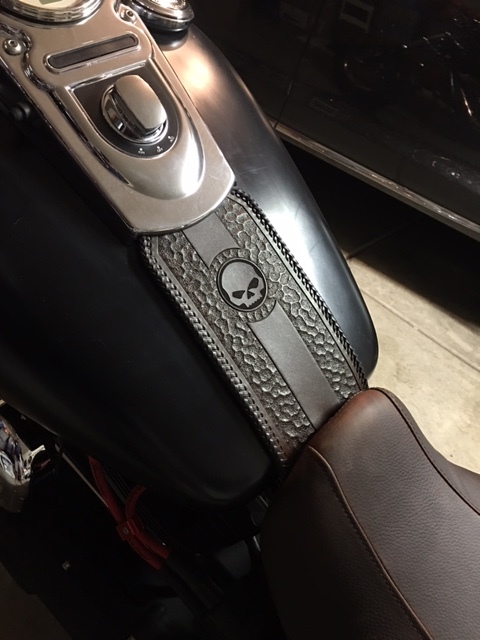 One of the items that have become popular this past year is tank bibs, fender bibs and bags that match the aftermarket seats for Harleys. 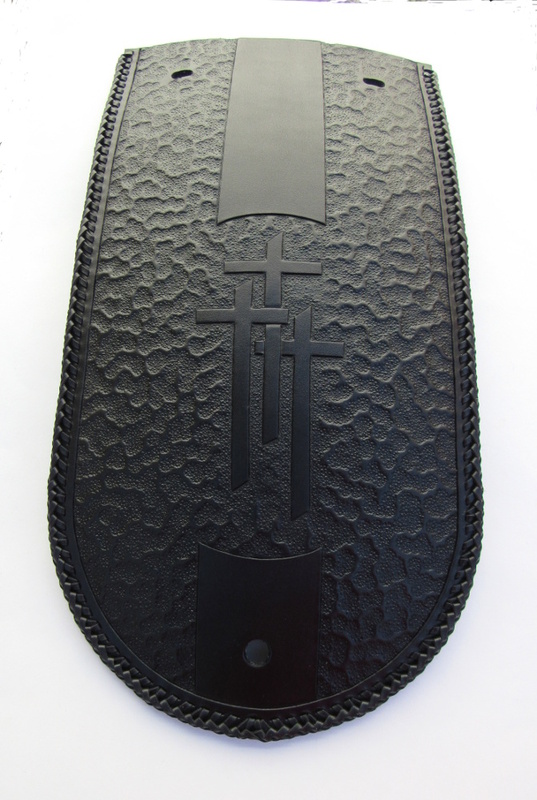 Turns out some of the biggest seat manufacturers; Corbin, Saddlemen, & LePera don’t make matching accessories. 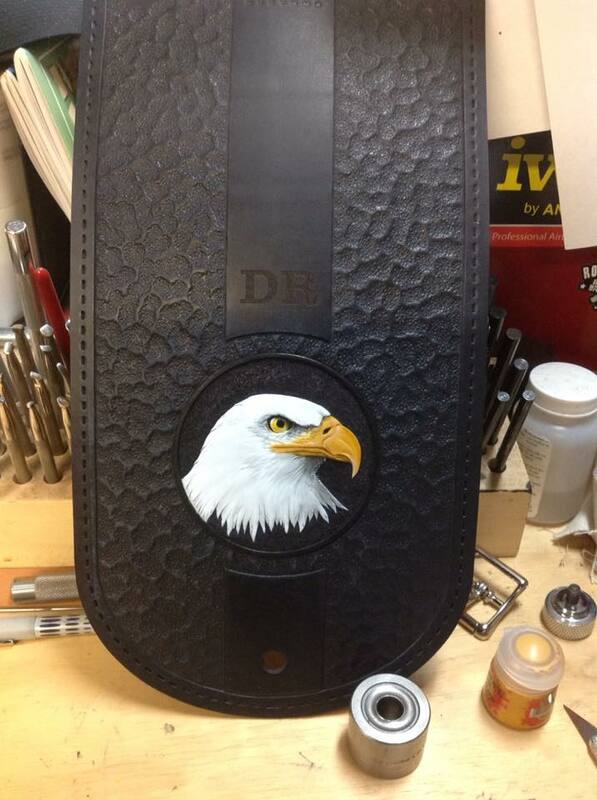 Mustang makes them, but only for their black seats. 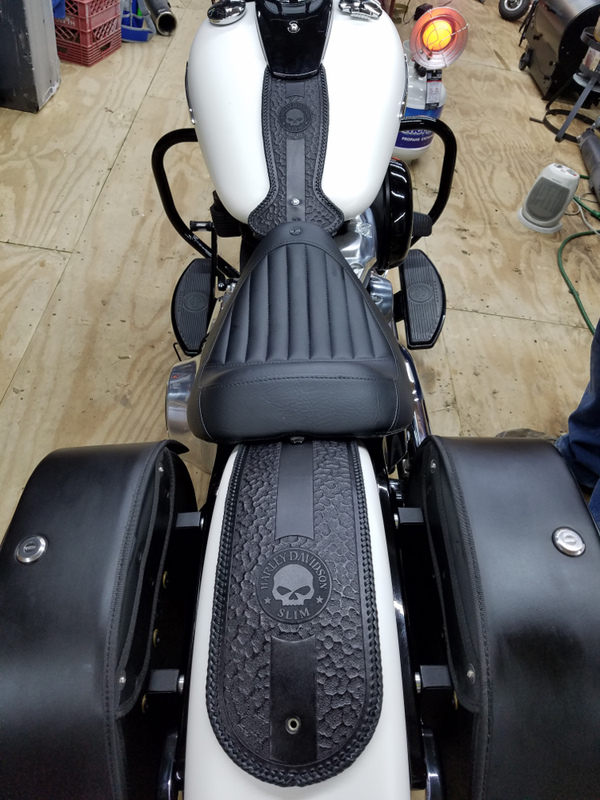 So after talking with each of them, I started designing and building matched sets for those folks looking to compliment their custom Harley cushion. 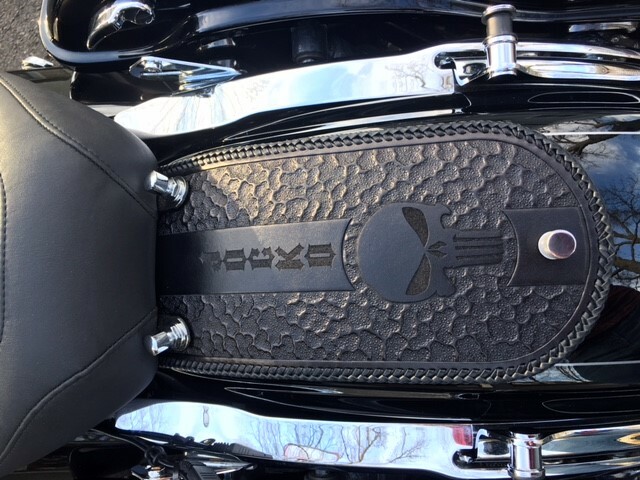 Each company features their own leather and vinyl selections so these are still a custom build based on bike model and seat bought, but all 4 companies work with me to buy smaller batches for custom builds to make our client’s visions come true! 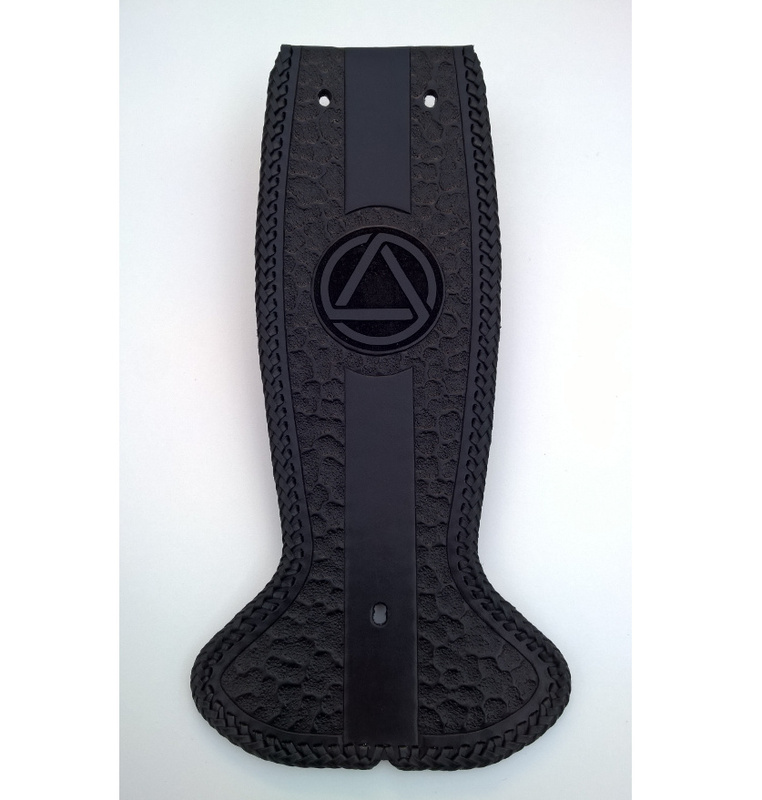 Here are photos of match tank bibs, fender bibs, swingarm bags, tool bags, leg guards and other bits we’ve done for each seat brand.